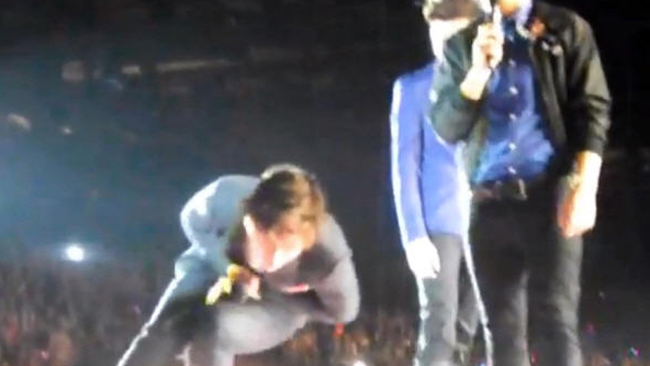 Harry Styles hit by shoe from fan during Glasgow Tour – Watch Video Here !! A fellow one-direction fan got overly excited on the latest Glasgow leg of the 1D Tour. A shoe was thrown and said to have struck Harry Styles who immediately fell to the floor after being struck by the shoe around the groin area. The shoe-hurling bandit has since been identified as a female high schooler named ‘Jade’ after her mother called the local radio show to own up to what her daughter did. The band were on stage answering questions during their Take Me Home tour in Glasgow on Tuesday night. The first shoe was flung on stage second earlier, missing the singers, but the second shoe made direct contact with Harry’s nether regions. The 19-year-old heart-throb bucked in pain and instantly fell to the stage clutching his groin as his band mates rushed to his aid. “I’m scared of shoes”, one joked after checking that Harry was OK, while another can be heard shouting “man down”. Determined not to let the rogue shoe-thrower have the last laugh, Styles eventually stands back up and performs a few exaggerated lunges around the stage – much to the delight of his screaming fans – before carrying on with the show. Luckily it was just a shoe and didn’t strike Harry anywhere more sensitive! There was a conspiracy theory that ‘Jade’ may have been a close friend to Taylor Swift !! ← One Direction – One Way or Another (Teenage Kicks) – Music Video Watch Here! !